FOR NATIVE INSTRUMENTS KONTAKT AND KONTAKT PLAYER 5.8.1 and up. In fact, the melodic percussion deserves a special mention as we made sure to catch all the subtlety and wonder of these instruments, including the seldom-sampled concert cimbalom, a dulcimer-like instrument with a unique sound. The dreamy melodic textures we composed for Indie were delicately played by our performers in the same space as the other ensembles. Marimba, xylophone, glockenspiel, vibraphone, crotales, upright piano, celesta and concert harp bring an intense personal feel to the whole collection. We felt that the Indie recordings were well suited to the playback engine which we originally debuted with ‘Noir’, our jazz-drenched section library. That means that the 12 preset keys each hold a single performance. Mapping phrases like this makes it easy to combine melodies and harmonies and hear real-time performances intertwine with one another. The randomize feature also makes a welcome return, which conjures twelve complimentary phrases with every press. There’s also the option to randomize per orchestral section, either string quartet, string ensemble, woodwinds, brass quintet or melodic percussion. Producing Indie was a experience like no other and we hope that when you hear it, you’ll feel the same way. We, at Sonokinetic BV, are very proud to introduce Indie to you and can’t wait to hear the amazing things you, our valued customer base, will produce with it. Left is the main interface for Indie. This particular screenshot is showing a woodwind phrase assigned to the F key, of the 12 available preset fields. 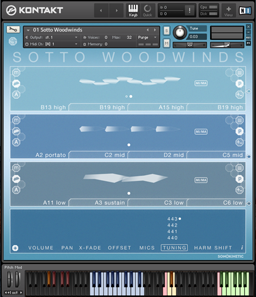 Each of the fields operates in the same way with options for choosing phrases, mod wheel control, tempo, score view, harmonic shift, offset, X-fade, panning and volume. There's also a far less artistic, but simpler GUI layout available by clicking on the Sonokinetic logo. This changes the text to a more standard font, increases the color contrast and unblurs the icons - useful for those with accessibility concerns. 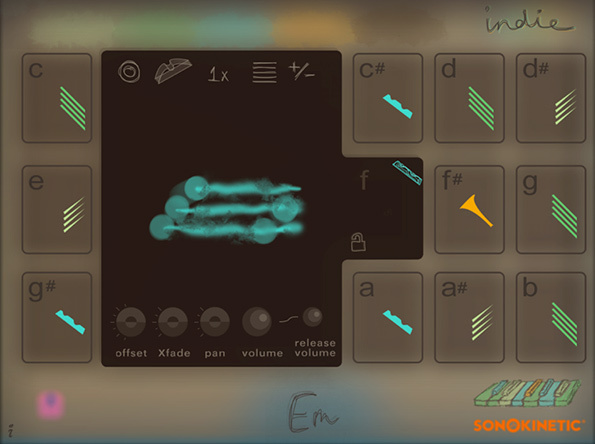 Indie has 12 preset keys that can be used to trigger phrases and these relate to 12 fields of the interface shown here. We've sampled string quartet, strings, woodwinds, brass and melodic percussion and you can play the phrases by playing keys from MIDI C3-B3. These are also tempo synced to your host DAW BPM. 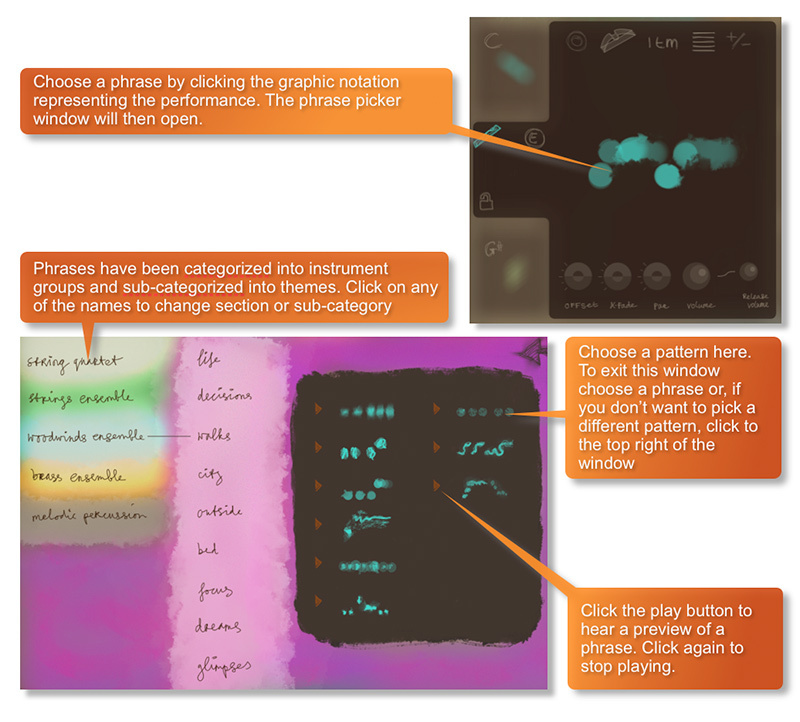 As you play each phrase the main interface graphic will change to display that phrase and preset field. 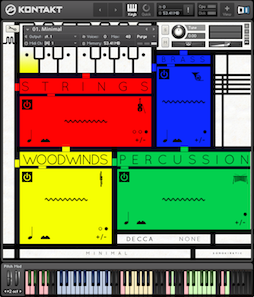 The colors of each of the 12 fields, which represent instrument sections, are also shown on the GUI keyboard - a quick reference for the 12 playing keys. You can purge the samples from an individual preset field with this icon - and click again to reload. Use this function to free up system RAM. By default the MOD wheel of your MIDI keyboard will control the output volume of all preset fields. However, it’s possible to disable MOD wheel control for one or more fields. This allows greater expression as you can keep the volume of one or more phrases constant whilst changing others with the MOD wheel. Use this to create interesting, constantly changing phrases and crescendos / decrescendos. Click this icon in each preset field to toggle MOD wheel control on / off. Phrases in Indie have been recorded at 100 BPM and will sync to your host DAW tempo by default, being time-stretched within Kontakt to match the BPM. However, it is possible to switch all phrases into half / double time. Click the ITM icon to change the playback speed of the phrase, relative to your DAW’s BPM. ITM : Automatic - “Intelligent Tempo Mapping” - Playback at recorded speed, but at automatic half / double time at extreme tempi. This is generally the best speed setting. However, if your project has a tempo change mid-phrase, you may find that an alternative speed setting may be more useful. Also, when you are doing gradual tempo changes across a large range, it might be a good idea to opt for one of the fixed values instead of ITM. The phrases in Indie are represented by graphics instead of actual notations. 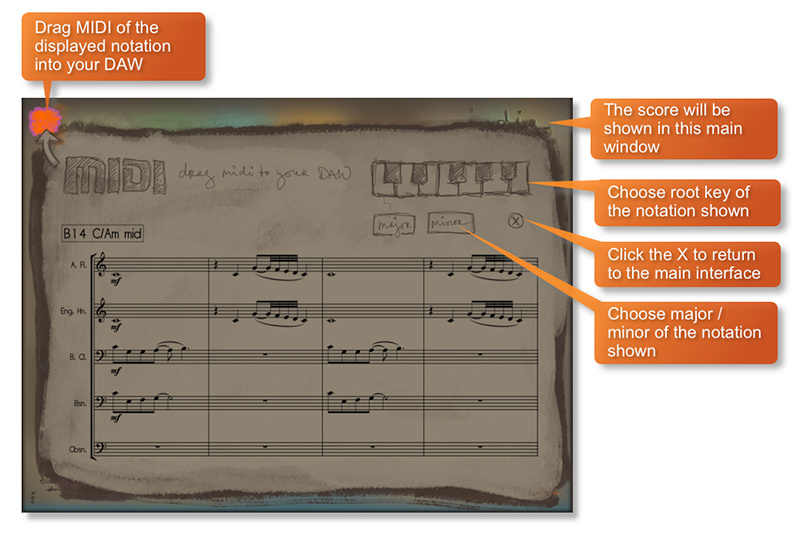 However, clicking on the score icon shown here will access the original notation. This will open a large Score View, where you can view the currently selected phrase in notated form. From this window you can directly access the score for your currently selected preset field and see the major, minor and dominant variations of it in all 12 root keys. 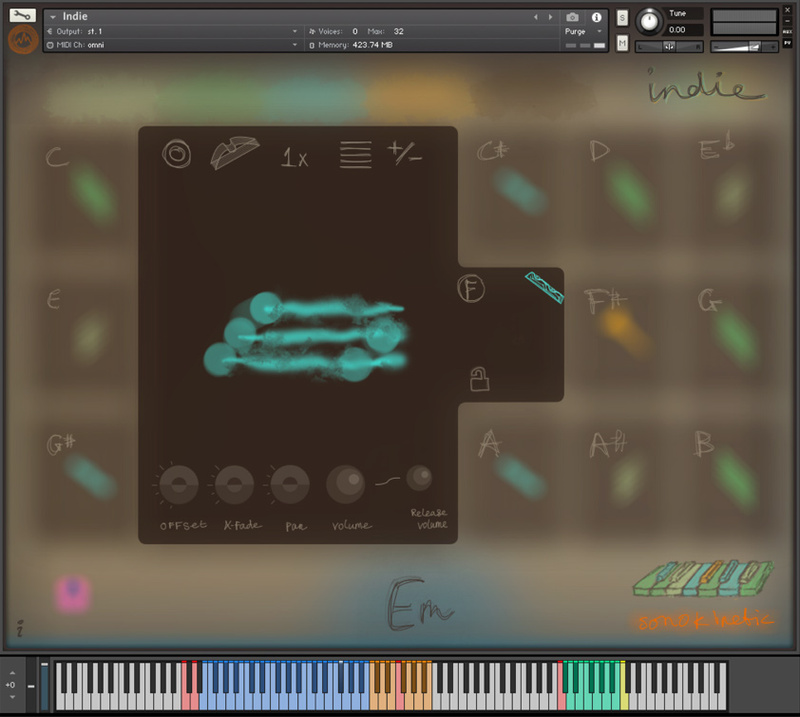 The Indie interface features a DRAG MIDI button in the score view window. 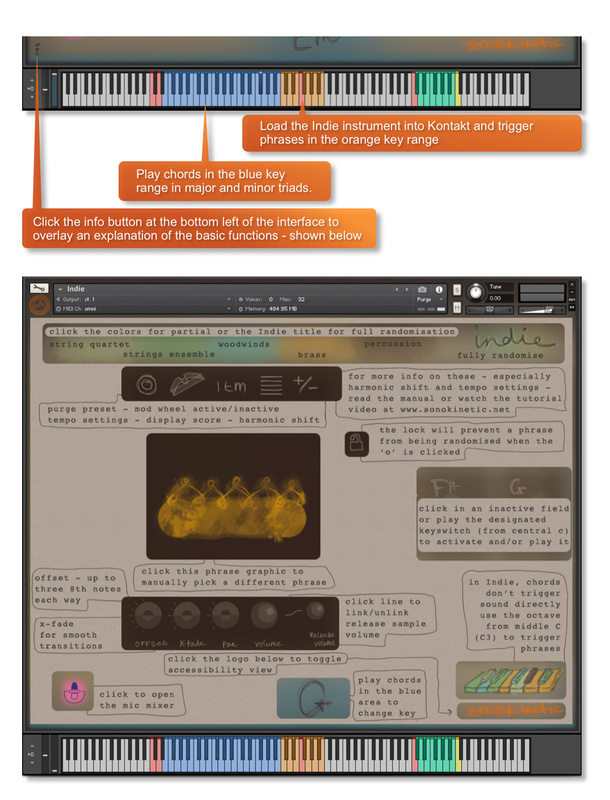 Click the MIDI legend or orange swatch, hold and drag into your DAW to paste the MIDI information from the Indie score straight into tracks of your DAW. 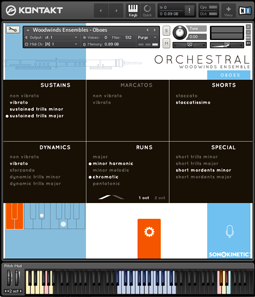 One or more MIDI tracks will be created in you DAW which correlate with the number of staves shown in the score view for that particular phrase. You can then assign your own virtual instruments to these tracks and edit the MIDI data in the normal way. We’ve developed this to be a real time-saver when you need access to the MIDI data of Indie outside of the instrument itself. 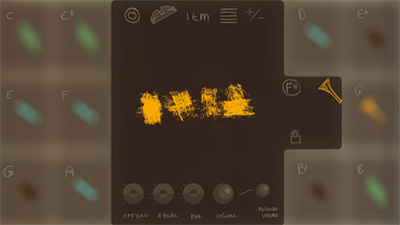 Drag MIDI is useful for several things and gives you ultimate flexibility over the notation of the phrases within Indie. For example, for doubling instruments, transposing or more complex editing. Drag MIDI also allows a quick and easy way for orchestrators to transfer Indie’s phrases to a score prepared for live players. Please note that the MIDI is derived from the original score that the musicians performed, not from the performance itself. Therefore the MIDI will not reflect the nuances of play, and you may have to adjust it manually to get a perfect match with the played performance when doubling it with external instruments. Also note that the MIDI dragged cannot be used as an input for Indie, you'll need other virtual instruments on different tracks in your DAW to play the dragged and dropped MIDI files. 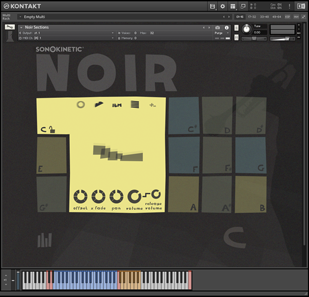 The Harmonic Shift function allows the user to play phrases simultaneously in different, but related, keys. This function can be used to access even more complex chord combinations and harmonies when phrases are played together. Harmonic Shift can be turned on or off for each preset field with the +/- button but it’s most useful if you turn it on for some preset fields and off in others. You should note that Harmonic Shift only designates an interval, relative to C. For example, playing an Em chord and then using the Harmonic Shift keyswitch at D# (an interval of a third) would add a minor third up from Em. This would result in a G major phrase being added. By default we have chosen a relative major or minor for each interval, which we deem most useful. The effectiveness and musicality of the Harmonic Shift varies, depending on the phrases you assign to each field and the harmonic shift intervals that you play. Experiment with different phrases and settings to create interesting and surprising textures and note combinations. Click this icon at the bottom left of the interface to display the microphone mixing controls. Mouse-over the pick swatch to activate the icon. The samples for Indie have been recorded in the same hall as sister libraries Largo, Noir, Espressivo, Tutti Vox, Ostinato series, Maximo, Woodwinds Ensembles, Sotto, Capriccio, Grosso, Minimal, Da Capo, Tutti and Vivace. As such, Indie has similar options for microphone mixing; Close, Decca Tree, Wide and Far (balcony). It is possible to use just one microphone position or mix between two different positions. Mixing is controlled by dragging the slider button. The crossfade operates in such a way that the central position will play both microphone positions at full volume. Microphone mixing options are global and apply to the entire instance of Indie including all phrases and fields. Note that activating multiple microphone sections puts additional strain on CPU usage. Use the OFFSET dial at the bottom of the preset field interface to change the sample start point of a preset field. Each line on the dial represents and 8th note. Note that when you double or halve the tempo of a phrase, the offset value will stay relative to the host tempo, so relative to the phrase content tempo these values will change. e.g. when the tempo button is set to 2x the offset value is doubled. You can also use the function to make more dramatic timing changes by offsetting one or more preset fields by entire beats, resulting in more complex patterns including polyrhythms and syncopation. Use the X-FADE dial at the bottom of the preset field interface to adjust the crossfade length of one sample into another when you change chords. Due to the natural human playing that’s been sampled and the wide variety of phrases within Indie, it may sometimes be necessary to adjust the crossfade of phrases when a new chord is played. This control will help to smooth out or tighten up transitions when used carefully. We’ll cover transitions and chord changes later in this manual. Use the PAN dial at the bottom of the preset field interface to adjust the panning of that phrase. Use the VOLUME dial at the bottom of the preset field interface to adjust the volume of that phrase. By default the volume of both the phrase sample and the release tail sample are locked together (shown here with an unbroken line between the two dials). Indie features release tail samples for all phrases. These give a realistic and appropriate release note or reverb tail when keys are released. The release samples become especially important if you choose to truncate the playback of a phrase, where a realistic end note will be played. The release tail volume of any phrase can be adjusted by using the RELEASE VOLUME dial shown here. You can unlock the release tail sample volume from the phrase samples by clicking the line between them - making it a dashed line. To turn the release samples off completely just turn the dial all the way anticlockwise. The basic method of playing Indie is very simple, just press a key in the range C3 to B3. Depending on what phrase is assigned to that preset field it will trigger a tempo-synced string quartet, string ensemble, woodwind, brass quintet or melodic percussion phrase. Sustain the phrase either by holding the note down or using a sustain pedal. For every new note you press, the phrase will start playback from the beginning, unless you have opted to adjust the OFFSET parameter or you have BAR SYNC / PHRASE CONTINUE set to on (see below). Phrase playback position is also effected by the PHRASE LINK control (see below). You can play simultaneous phrases by pressing more than one preset field key at a time. Use the blue key range from MIDI E0-B2 to play major and minor triad chords. 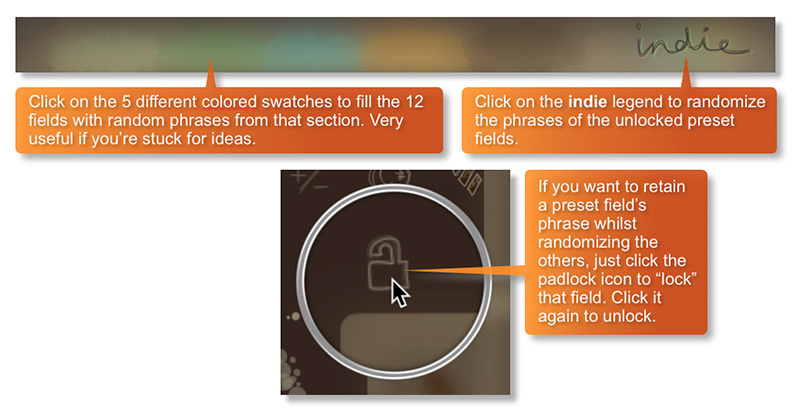 The playing phrase will change in key to match whichever chord you choose. Keys from MIDI C6-B6 dictate the harmonic shift interval of one or more preset fields. We have designed the chord recognition system within Indie to be as simple as possible, but you will still need to play the correct keys to correct chords. The system recognises inversions. When playing different chords or applying different Harmonic Shift intervals, you have the choice whether to retrigger the phrases or to simply continue the phrase but in the new key. This function is controlled by velocity sensitive key switch C0. High velocity (>84) will turn phrase continue on, low velocity (<83) will turn it off. Indie can use a ‘Bar Sync’ option. This is controlled by velocity sensitive key switch D0. High velocity (>84) will turn it on, low velocity (<83) will turn it off. This feature works in conjunction with the ‘Phrase Continue’ function. When switched on, the scripting within Indie will read the position of the bar in your host DAW and retain playback of the phrases in line with that bar. For example, if Bar Sync is turned on and you trigger a phrase on the second beat of a bar, the sample will play from its second beat too. Indie has a unique function for advanced users that was not previously seen in sister library, Noir. We have called this function ‘phrase link’ and it allows you to link / sync the playback of two or more phrases to one another. This is useful when you play one phrase and then you trigger a second phrase and want it to jump in at the same point in the bar, rather than playing from the beginning. Press the hidden keyswitch at A#-1 to reveal which of the 12 keys in the playable range from C3 to B3 are linked to one another. When two or more phrases are colored red (and thus linked together) you will hear that they sync with one another when played back together, regardless of when you trigger the keys. The internal clock for this function is set by the first phrase that you play and all other linked phrases will conform to that timing. Using the powerful Phrase Link function has some very creative possibilities, especially important because Indie has so much melodic material. For example, you can start playback of a phrase at any point, by using a silent phrase as a reference point - turn the volume of that field all the way to zero. You can then jump into subsequent phrases at any point. This file has been locked. No copying options will be available. This score only covers cues in the keys recorded for the product. There are three recorded keys for each cue, and three more where a separate minor version was needed. Login to check your eligibility.